MAMNA, India, Mar 8 2016 (IPS) - Prema Bai, 58, bends her head and pushes hard her wheelchair on the village road. In the early afternoon, the village of Mamna appears almost deserted although it is home to 742 families and is located in Uttar Pradesh – India’s largest and most populated state. Thanks to a severe drought, every man and woman under 50 has fled Mamna in recent weeks, leaving behind the elderly and women with very young children. “They thought we were like cattle, a burden in this hard time because we only eat but yield no returns,” says Bai whose two sons and their wives also migrated to Agra — a city 255 km away — to work in a brick kiln. They were wrong: despite being paralysed from her waist downwards, Bai is working along with her women neighbours to end the water crisis in her village. Dressed in blue that symbolises water, Bai and her fellow women have a new name for themselves: ‘Jal Saheli’ (meaning ‘Water Friend’ in Hindi). Under the Indian Constitution, discriminating against anyone on the basis of caste or religion is a crime. But in Mamna,, those from the “higher” castes, enjoy more power or rights than those from the dalit and tribal communities. So, when it comes to fetching water from the community pond or well, women of dalit and tribal women must wait until those from the higher castes have first filled their vessels. Often, higher caste men also draw water from the community pond for irrigation or bathing their cattle, without any consideration for women waiting to collect water for their families. 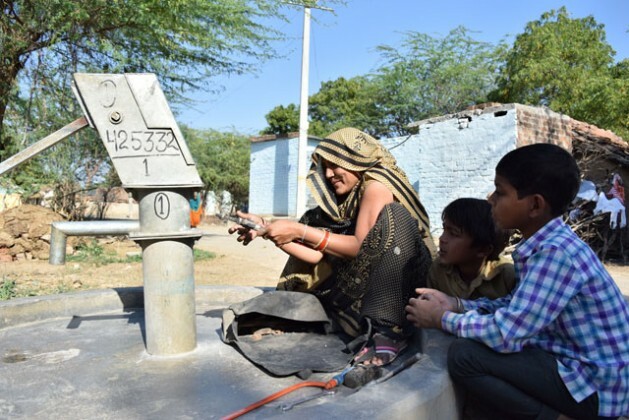 In 2011, under a European Union (EU)-funded project, women from dalit, tribal and muslim families in 110 villages in three districts – Hamirpur, Lalitpur and Jalaun – began to stand up against this cycle of discrimination and claim their right to local water sources. “These villages are part of a region called Bundelkhand. Here, every woman spends about 3- 5 hours daily to get water because it is thought to be a woman’s duty to fetch water for her family. We felt that only a women-led movement could ease this huge water burden,” says Satish Chandra, activist and trainer at Parmarth Seva Sevi Sansthan – a local charity that works with marginalised people of the region and is implementing the EU-funded project. Kunti Devi, another Jal Saheli from Mamna village, says that as the first step towards making their village water secure, the women formed a special group called the “water council”. The council drew a map of their village that detailed all the existing water sources including irrigation canals, torrential streams, wells, ponds and bogs and their current status. Next, the council counted the population of the village and calculated the daily water needs of each family. Families living close to the water and far from it were identified. Finally, the women made a detailed plan to cleanse, revive and protect the water sources from indiscriminate use. But, despite their sincere efforts, achieving total water security has been a long-drawn battle and so far 34 of the total villages have become water secure, informs Manvendra Singh – another trainer at Parmarth. The main hurdle, say women, is that the Bundelkhand region has been hard- hit by successive droughts. For example, between June 1 and September 30, 2015, Lalitpur district received only 321.3 mm of rain, which is 66 per cent less than normal, says the Indian Meteorological Department. In November 2015, the government of Uttar Pradesh declared all the seven Bundelkhand districts as drought-affected. Rapidly depleting ground water level has been another concern. “In 2011, when the project was first launched, the average water level was 60 feet. Four years later, it has dropped at least by 10 feet,” Chandra of Parmarth informs. Although a few villages like Bamoria have tap water — a result of their intense lobbying local officials — most villages still depend on government-installed hand-pumped wells for their daily water needs since ponds and streams dried up. However, hand-pumped wells also break down often, so the women have learned to repair them. “The most common problems are a worn washer, a broken pin or a loose bearing etc which makes the handle too shaky to pump water. Now we fix all these problems ourselves. Only when the water level goes down, we depend on the government to deepen the well,” says Kamlesh Kumari. Jayati Janta – a Sahariya tribal woman and a Jal Saheli was recently elected the head of Rajawan village council despite stiff opposition from men of higher castes. Only 2 months into office, Janta is already implementing the water security plan that includes building a percolation tank to recharge the ground water in the village. “Every woman is donating labor for this,” she says. Others believe that Janta’s election will be a turning point. “A Jal Saheli knows local women’s struggle for water. If we can have a few more ‘Jal Saheli’ in the public offices, we can change this region,” says Lalita Dube, a Jal Saheli in Bhadauna village. This story is based on interviews of women in over 20 villages. Additionally, the writer has relied on a documented study of the project.